To view additional points on the map, please zoom in closer on the icons. The Edward D. Forman collection of postcards provides an excellent example of how soldiers communicated and memorialized their military service during World War I. Nearly all of the postcards in Forman’s collection were written to his future wife, Mae Kaiser. 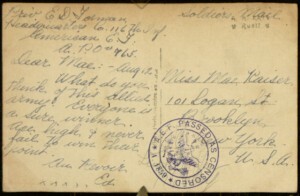 These postcards provided Forman with a way of sharing his experiences during war with the woman he loved, enabling him to continue a valued relationship despite the separation imposed upon Forman and Mae. One might expect these postcards to be filled with romantic sentiments; however, expressions of love and romance are the exception to the generally matter of fact tone of Forman’s writing. Of course, postcards have very limited space for writing, which surely caused Forman to write succinctly. Furthermore, the censorship of military letters perhaps placed a certain level of restraint on Forman’s sentiments. 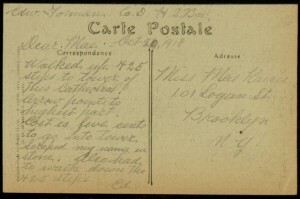 Nevertheless, his emphasis on telling Mae of his travels, and the places he saw while in the service, indicate that Forman hoped to memorialize his wartime experiences through the postcards by creating visual and textual reminders of the places he visited. Investigating the concept of communication and memory in Forman’s postcards required transcribing the postcards and then placing each postcard with its transcription on a map. Google My Maps made it possible to create a map that displayed all of the necessary information. The benefit of the map is that viewing the transcriptions and documents on a map provides a visual representation of how Forman wrote about the places he visited during the war, since the map displays the locations from which Forman wrote the postcards. Some locations on the map are exact while others are only approximate; at times, the postcards clearly indicate where Forman was when he wrote the short note to Mae, whereas at other times, Forman only provided a vague description of his location. Remedying the uncertainty of some places required making an educated guess as to the location. In some cities, Forman wrote multiple postcards, but placing multiple map markers on one location proved to be difficult. 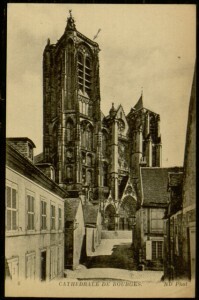 Therefore, making educated guesses was also necessary for the locations from which Forman wrote several postcards, such as Paris and Bourges, France. Additionally, most of the postcards contain exact dates, but several have no date at all, though the bibliographic information on Falvey Memorial Library’s Digital Library website generally indicates at least the year. Thus, when viewing the map, the reader is asked to remember that not all locations and dates are precise. When viewing the map, please keep in mind that it is necessary to zoom in on the locations to see all of the place markers. The Forman Collection contains fifty items, but only thirty-four include text; therefore, only these thirty-four are included on the map. Additionally, the various icons represent different years; the brown balloon represents the year 1917, the purple envelope represents the year 1918, and the yellow envelope represents the year 1919. Forman wrote the vast majority of his postcards in the year 1918, during the U.S. Army’s most active time in World War I. Perhaps, then, Forman wrote so many postcards to Mae throughout this year as a way of comforting himself amidst the stress of war. Perhaps he also wrote to Mae so often to soothe homesickness and loneliness, and maintain a sense of assurance that those at home still loved him. To visualize how Forman’s communications with Mae changed throughout the war, please view the following word clouds, made with Voyant. The first word cloud includes the year 1917 with the war year of 1918, since Forman only wrote one postcard in 1917. To avoid skewing the results, information in the postmarks and exact addresses was not included in the analyzed text; however, towns and dates were included. Additionally, given that only three postcards were written in 1919, it is difficult to get a true sense of how communication changed over the course of the war. However, the word clouds do demonstrate a focus on the places Forman traveled to, but yet he and Mae remain the center of the word clouds, indicating the importance of their relationship. 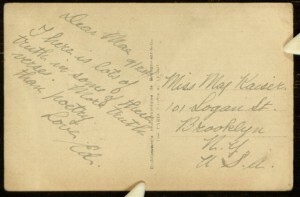 Edward D. Forman to Mae Kaiser, postcard, October 20, 1918, Collection of Postcards from Edward D. Forman, Digital Library, Villanova University, http://digital.library.villanova.edu/Item/vudl:334221. Of course, a lack of romantic sentiment is not unheard of in other World War I letters; while studying a collection of letters written between a Canadian couple during the War, Megan Robertson found that the soldier’s letters were somewhat formulaic. However, the emphasis on Forman’s travels that contributes to this lack of romantic sentiment in his cards indicates that Forman was hoping to document his journeys with the postcards he sent home. The military also had to censor letters and postcards soldiers sent to their loved ones. Quite a few of Forman’s postcards bear a stamp stating that they had “passed as censored.” The postcard dated August 12, 1918, written from Paris, France, provides a good example of a ‘censored’ mark. Edward D. Forman to Mae Kaiser, postcard, August 12, 1918, Collection of Postcards from Edward D. Forman, Digital Library, Villanova University, http://digital.library.villanova.edu/Item/vudl:336028. Given the matter of censorship, it would seem logical if Forman’s language in the postcards written from the United States was more open and informative than in the cards written in Europe. Interestingly, however, when comparing the texts in the postcards Forman wrote while in the states with those he wrote in Europe, the cards written in Europe sometimes contain more information than those written in the states. Of course, more postcards were written from Europe than from the U.S., and thus a comparison between the two is somewhat unequal. Still, it is interesting to note that perhaps Forman’s lack of sentiment and emphasis on his travels was a consequence of realizing that the censors would read his words to Mae. Regardless of why Forman wrote his postcards as he did, the collection has transformed into the embodiment of his memories. Now preserved at Falvey Memorial Library’s Special Collections, as well as online, Forman’s postcards memorialize where he traveled during the war, and the things he did that gave him pleasure. 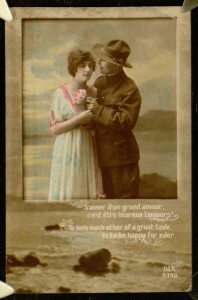 Certain postcards, though few, do demonstrate the love Forman and Mae shared, such as the postcard dated September 24, 1918, written from France. Edward D. Forman to Mae Kaiser, postcard, September 24, 1918, Collection of Postcards from Edward D. Forman, Digital Library, Villanova University, http://digital.library.villanova.edu/Item/vudl:336024. By documenting Forman’s travels, love, and life during the war, the postcards now serve as memories of what he experienced during World War I. As stated by Robertson, collections of World War I letters can “help to transform an event that happened nearly a century ago and demonstrate that those who lived through the Great War were not so very different from you or me in their concerns for family, friends, and their dreams for their futures. The letters matter now more than ever because the relationships that sustained their existence have begun to fade.” As a collection of memories, the Forman postcards do show the similarities between people who desired to record their travels during the Great War, and those who similarly document their lives with modern formats. The collection is a valuable resource for those interested in learning more about wartime communication and how soldiers memorialized their experiences through the postcards they selected to send home. It is difficult, and perhaps even impossible, to know definitively why Forman wrote to Mae as he did – whether it was to allow the postcards to pass the censors, or because Forman was mostly concerned with documenting his travels. However, the nature of the postcards, which show troop encampments, artwork, and buildings and scenes in Europe and America, indicate that Forman hoped to memorialize his wartime experiences through his communications with Mae. Now, these same postcards serve as visual and physical representations of Forman’s memories of the Great War. Acton, Carol. “Writing and Waiting: The First World War Correspondence between Vera Brittain and Roland Leighton.” Gender & History 11, no. 1 (April 1999): 54-83. Bonfiglioli, Margaret, and James Munson, eds. Full of Hope and Fear: The Great War Letters of an Oxford Family. Oxford: Oxford University Press, 2014. 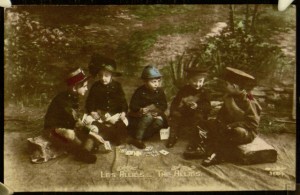 Collection of Postcards From Edward D. Forman, Digital Library, Villanova University. http://digital.library.villanova.edu/Item/vudl:336023. Hanna, Martha. “War Letters: Communication between Front and Home Front.” In 1914-1918-Online: International Encyclopedia of the First World War, ed. Ute Daniel, Peter Gatrell, Oliver Janz, Heather Jones, Jennifer Keene, Alan Kramer, and Bill Nasson. Berlin: Freie Universität Berlin, 2014. doi: http://dx.doi.org/10.15463/ie1418.10362. Hubbard, Riley. “America and World War I: A Brief Overview.” Remembering World War 1. https://rememberingwwi.villanova.edu/america-and-world-war-i-a-brief-overview/. Robertson, Megan. “Epistolary Memory: First World War Letters to British Columbia.” BC Studies no. 182 (Summer 2014): 125-150. Martha Hanna, “War Letters: Communication between Front and Home Front,” in 1914-1918-Online: International Encyclopedia of the First World War, ed. Ute Daniel, et al, (Berlin: Freie Universität Berlin, 2014), doi: http://dx.doi.org/10.15463/ie1418.10362. Carol Acton, “Writing and Waiting: The First World War Correspondence between Vera Brittain and Roland Leighton,” Gender & History 11, no. 1 (April 1999): 62. Megan Robertson, “Epistolary Memory: First World War Letters to British Columbia,” BC Studies no. 182 (Summer 2014): 126. Margaret Bonfiglioli and James Munson, Full of Hope and Fear: The Great War Letters of an Oxford Family (Oxford: Oxford University Press, 2014), xxviii-xxix; Martha Hanna, “War Letters: Communication between Front and Home Front,” in 1914-1918-Online: International Encyclopedia of the First World War, ed. Ute Daniel, et al, (Berlin: Freie Universität Berlin, 2014), doi: http://dx.doi.org/10.15463/ie1418.10362. Megan Robertson, “Epistolary Memory: First World War Letters to British Columbia,” BC Studies no. 182 (Summer 2014): 131. Carol Acton, “Writing and Waiting: The First World War Correspondence between Vera Brittain and Roland Leighton,” Gender & History 11, no. 1 (April 1999): 62; Megan Robertson, “Epistolary Memory: First World War Letters to British Columbia,” BC Studies no. 182 (Summer 2014): 136. Megan Robertson, “Epistolary Memory: First World War Letters to British Columbia,” BC Studies no. 182 (Summer 2014): 128.